Discussion in 'Chainsaws' started by AlfA01, Nov 8, 2018. So, I woke up bright and early this morning and was ready to hit the field and pick some olives, but it was raining. So, I says to the wife, "lets go run some errands and while we're out I'll stop by Husqvarna and see if my parts arrived." 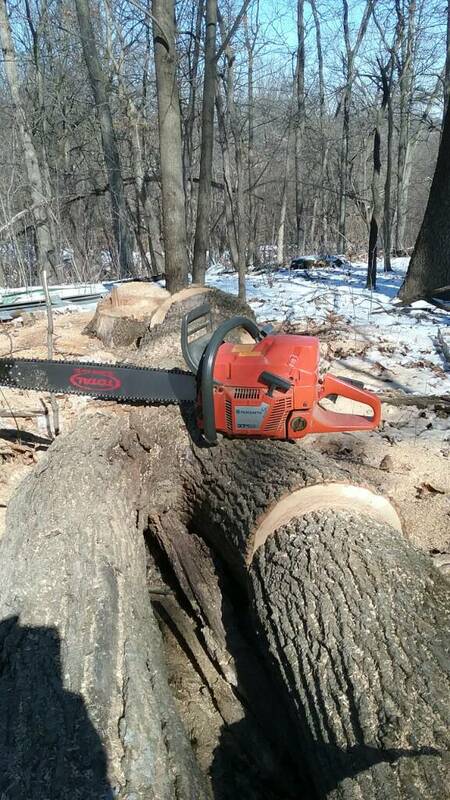 The shop was full with customers so I set out to view the chainsaws in stock. Low and behold, like a ray of sunshine on this gloomy day....boom! a brand new 371XP was sitting on the shelf. I waited patiently until the crowd thinned, and picked up the parts I ordered, then decided spontaneously to pursue purchasing this magnificent beast. Not one to pay full price, I set to dickering with the owner of the shop. He has messed up three of my last four parts orders and had really chaffed my willy, so he decides he'll give it to me at the same price as a 346XP. So, out comes the debit card and into the old green Kia this fine saw went. Now, what to do with it? Should I keep it stock? Should I put my MMWS cylinder on it? Or, should I pass it along to one you guys? Decisions....what to do? Definitive Dave, Tor R, Lee H and 24 others like this. I see so many pics with chains hanging off the bar. Am I supposed to be loosening the chain when not in use? How does the 371 compare to the 372? Personally, if you dont NEED it, I'd sell it to the less fortunate who need a big saw. Cat 525 and AlfA01 like this. Once CAD has got full hold of you, its not an option to walk away from opportunities to acquire legendary NOS saws at heavily discounted prices. Well done sir! Tor R, smokey7, NCFarmboy and 8 others like this. Keep it! And keep this relice stock. Definitive Dave, Tor R, Cut4fun and 6 others like this. My zoo city 372s are excellent runner's. Tor R, smokey7, XP_Slinger and 4 others like this. It was the only one on the shelf with a loose chain, so I don't think there is a method behind it. Just don't tighten your chain when the saw is hot and leave it that way. It can possibly tweak your crank after cooling and the metal contracting. Never seen it happen, but it does make some sense to me that it's possible. Same saw, but this was the predecessor to the 372OE. This one is from the last year of production. Tor R, huskyboy, MustangMike and 3 others like this. Tor R, smokey7, AlfA01 and 2 others like this. Tor R, smokey7, NCFarmboy and 3 others like this. He coughed up the hard nose bar and Oregon 3/8" chain with it. Tor R, Redbull661, Wolverine and 4 others like this. Shelve that HN bar. The saw ain't that old lol. smokey7, Cat 525 and XP_Slinger like this. Tor R, Wolverine, Fishnuts2 and 10 others like this. I'm right there with you buddy! Been running my carb saws and letting the AT's sit. I wanted it for stumping and cutting dirty wood, not for this saw. We see these quite often here on Husky's I've noticed lately. I think the bar is newer than the saw. Cat 525 and XP_Slinger like this. so he decides he'll give it to me at the same price as a 346XP. Some of us know what you pay for a 346 so you have to ask yourself; self do I have a big mouth? smokey7, mdavlee, AlfA01 and 4 others like this. Damn fine saw, do with it what you want brother! I’d run the hell out of it! What’s the point if you aren’t throwing some chips with it? smokey7, AlfA01, Cat 525 and 2 others like this. I run every saw that I have, and none of them stay stock! If I like how they run with what I can do to them, great, if not I send them out to someone. smokey7, Cat 525, dahmer and 1 other person like this. Believe it or not that 371 weighs less than a 462 dry pho. (13lbs vs 13.2lbs). According to the specs... which ain’t always true. Just interesting I thought. Wolverine, XP_Slinger, AlfA01 and 3 others like this. I was in the OP's position a couple years ago. Bought a NOS 357xp locally. I'd never run one before and wanted the chance to try it, but couldn't really justify owning another 60cc saw and I didn't want to take the $$ hit by putting it in wood. I still wonder what that saw ran like. I do have a line on a 2159 though, one that's already been broken in. So hopefully that will scratch the itch and if I decide to pass it on after running it a while I think I' should be ableable re most of the cost. XP_Slinger, AlfA01, Cat 525 and 4 others like this. I Love my 371 mild WP, MM. 371's are lighter than 372OE. Can't remember how much. It's like stihl 046 and ms660 046 IS lighter. huskyboy, MustangMike, Cat 525 and 1 other person like this. Tor R, MustangMike, XP_Slinger and 1 other person like this. Need a couple of parts for earth quake.